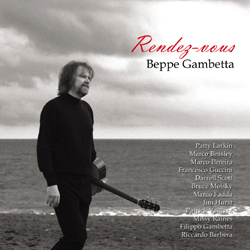 Gadfly Records is proud to release “Rendez-vous” from guitar wizard Beppe Gambetta. Gambetta returns with a new CD of original duets, including a stunning lead-off track with Patty Larkin. Once again, the flat-picking maestro proves that he is a world-class musician with an extraordinary sense of melody and ingenuity. With Rendez-vous I’m trying to break the borders of the flatpicking technique in a creative way, experimenting with new “full sounding” solutions to obtain a sort of a “plectrum-fingerstyle” sound in an unusual synthesis. I have the pleasure to present to the listeners artists that come from completely different artistic worlds in a really stimulating combination: from the singer-songwriting avant-garde of Patty Larkin and Darrell Scott to the Italian wave of the Sixties of Francesco Guccini, from the newgrass mastery of Missy Raines and Jim Hurst to the early-music tenor voice of Marco Beasley; from the button accordion of my son Filippo Gambetta to the guitar of the Brasilian maestro Marco Pereira, from the progressive European style of French mandolinist Patrick Vaillant to the ethno-urban percussions of Marco Fadda and the jazzy bass of Riccardo Barbera.